Keeping the kids occupied for an hour or so on a wet afternoon can be difficult but not if you combine cooking with crafts. Especially if the end result is edible jewellery! Jewellery made from food is even finding its way onto the fashion catwalks. The recipes we're suggesting aren't quite as intricate but they'll please bored or hungry kids. As always when doing any sort of cooking with kids, adult supervision and help is needed for younger children but older kids should be able to manage most of this on their own. You'll just have to supply the ingredients. One of the easiest recipes is for a very simple necklace. Provide each child with a length of fine string long enough to fit easily over her head. Remember to allow extra for the knots. Fill small bowls with Cheerios cereal or hoop crisps. Thread one of the cheerios onto the string and knot it to prevent it falling off. Let your children continue threading the cereal hoops onto the string. When they've filled it, knot the ends together. And they have a necklace to wear and a snack to nibble! If your children like liquorice, use liquorice shoelaces instead of string to thread sweets onto. 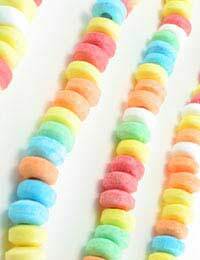 Using strong sewing cotton and a plastic craft needle, thread soft sweets such as jelly beans, fruit pastilles, wine gums, or coloured crispy rice, popcorn or even jelly babies! Have small bowls full of differently coloured sweets available and let the children each design their own. Thin elastic works well as the base for bracelets. Follow the same instructions as for the necklaces. Don't use chocolate drops or buttons as they'll melt and become sticky too quickly. It's not advisable to use smarties either as the colour will quickly rub off onto clothes. Use unsweetened popcorn for a chunky and funky look. Use firm small tomatoes or grapes. Mix green and red grapes. Try raisins or sultanas for a fruity flavour. Sunflower seeds make a nutritious nibblesome bracelet. Use carrot sticks for an ethnic style necklace. Rice Krispies can be threaded onto cotton for a crunchy snack to wear. While it's not advisable to use chocolate for kids' necklaces, they might like to make a special present for a special person - you maybe! Ferrero Rocher chocolates are ideal for this recipe. Remove the brown paper case and thread some thin ribbon through the gold foil wrapping. The ribbon needs to be long enough to hang freely around the neck, with an extra length for knotting. These could be used as medals or rewards for helpful behaviour or thoughtfulness. Alternatively a pendant could be made using a thin piece of clean card as a base. Rice paper is another option but is slightly more fragile. Cut out the pendant shape from the cardboard. Make a neat hole near the top.Using a small brush or fingers, dab edible glue onto sweets and arrange in a pattern on the cardboard. When set, thread a pretty ribbon through the pendant and knot. Mix icing sugar with water to make a thin sticky paste. You need about ½ cup of cornflour to 2 cups of water. Mix cold water, a teaspoon at a time, with the cornflour. When you have a thick smooth paste, gradually add very hot water a drop at a time and stir well. Keep stirring as you add the hot water. As the cornflour cooks, a smooth thick glue will form. But a handy means of taking sweets on a journey. Make a sweetmark! Like a bookmark but made of sweets. Use thin white card for the base and cover with dolly mixtures dipped in edible glue. Leave to set.